Let me introduce you to a lovely piece of goodness. This little bite of joy is apparently a Canadian treat, and when I saw a recipe for it online some months back, I knew it would be something Ben would enjoy. Chocolate, nuts and coconut in the base, a sweet and smooth middle, and chocolate on top. Oh, it’s as good as it sounds. Actually, it’s better. And it is surprisingly not sickly sweet. Ben said it probably topped his old-time favourite, Country House Butterscotch Brownies, which says a lot. 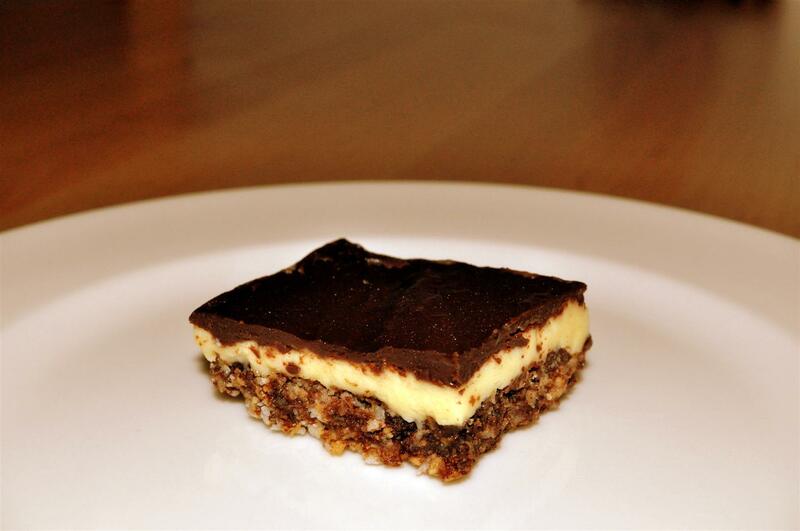 It’s called a Nanaimo Bar, and you should go make some. Soon. Here’s a link to the recipe I used. This looks like a must-bake recipe to me! I hits me in all the make-my-tummy-happy places: chocolate (check), nuts (check), coconut (check), vanilla cream (check). I’m printing off the recipe, to get the ingredients at the store. Hahaha, Jessica is making them this very moment. One of our favorites. Looks amazing! How pronounced is the coconut flavor/texture? Hmmm, it’s not the main flavour or texture.. perhaps a bit like in Cherry Delight. Looks yummy – and if it’s better than Country House Brownies, it’s gotta be! We’ll try them as soon as our supply of Christmas chocolates and cookies has dwindled a little.